A DNA-binding transcription metabolite that positively modulates an allosteric Enzyme or regulates one or more genes by increasing the rate of transcription. A protein required for recognition by rNA polymerases of specific stimulatory sequences in eukaryotic genes. The reduction of a chemical Compound to one less complex, as by splitting off one or more groups. Gene elimination from differentiating cells in some protozoans, insects, and crustaceans. An increase in the frequency of a gene or chromosomal region, as a result of replicating a DNA segment by in vivo or in vitro process, such as by gene duplication or polymerase chain reaction, respectively. Genetic elements important in the function of a specific promoter. The process by which introns are removed from hnRNA to produce mature messenger RNA that contains only exons. A permanent, heritable change in the nucleotide sequence in a gene or a chromosome. A biochemical process involving addition of methyl groups to DNA, silencing a gene or cluster of genes. 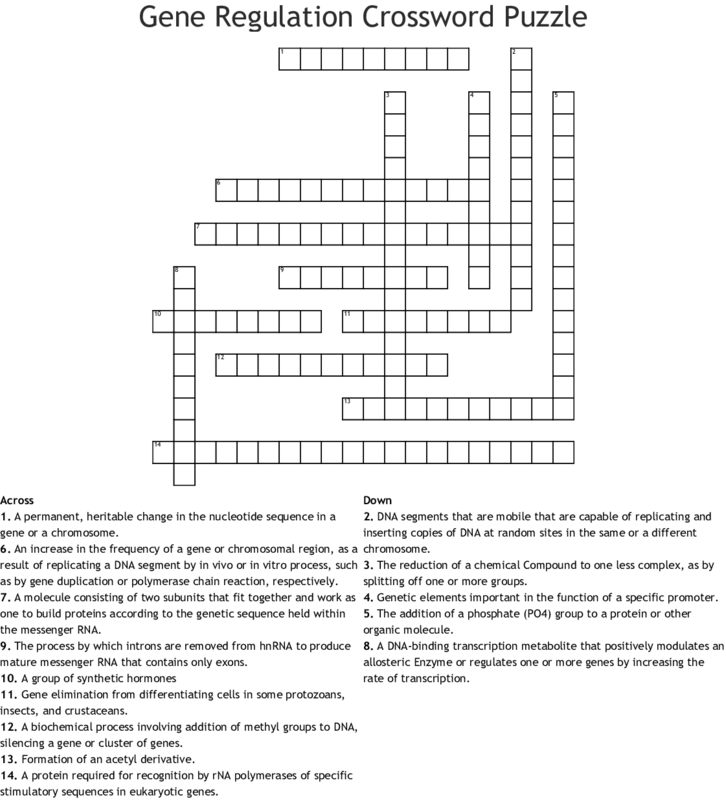 DNA segments that are mobile that are capable of replicating and inserting copies of DNA at random sites in the same or a different chromosome. The addition of a phosphate (PO4) group to a protein or other organic molecule. A molecule consisting of two subunits that fit together and work as one to build proteins according to the genetic sequence held within the messenger RNA.